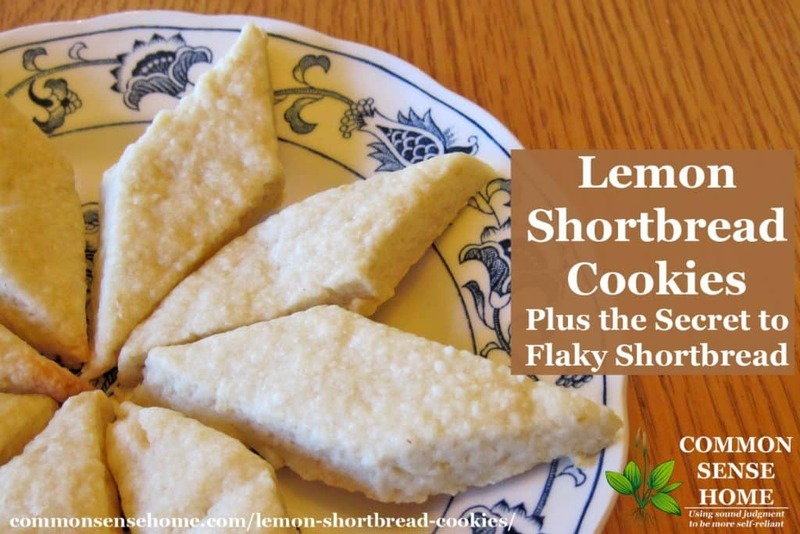 I have always liked lemon shortbread cookies – simple, delicate – they're all about using good quality ingredients and handling them correctly. With the lovely lemon and a sprinkle of powdered sugar, and you've got a cookie that's fancy enough for a party but easy enough for a treat anytime. If you want to dress them up a little more, you can add some color before baking, or dust with a bit of decorating sugar, but I like to keep them simple. 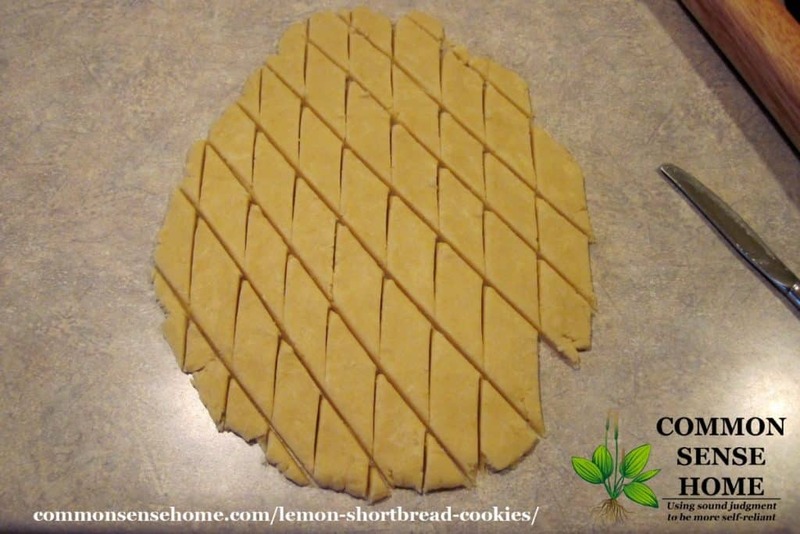 The secret to perfect shortbread is to keep your ingredients cold, and don't overwork the dough. Cold butter will not be absorbed by the flour. 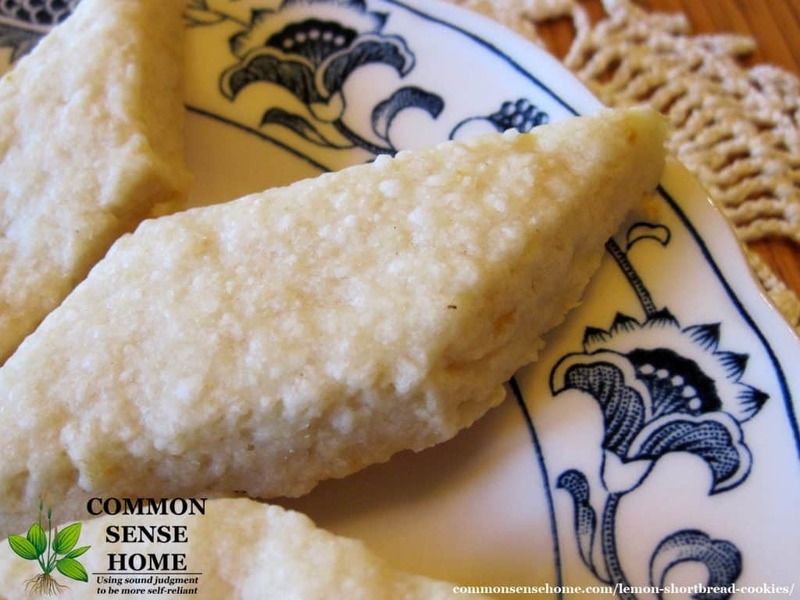 Instead, it will form tiny pockets in the dough, leaving a light, buttery texture. Over-mixing the dough will melt the butter, and may even start to develop the gluten in the flour, making it tough instead of flaky. Mix the dough until just blended – no more. Chill before rolling and baking. I had this demonstrated when my friend, Julie, visited. We both made the same recipe, but it tasted like two different recipes because of the way the dough was handled. Cut together butter, sugar, zest and extract with a fork or pastry blender. Cut in flour until well blended, form into a ball with your hands. If dough seems dry, you can add a bit of lemon juice. It should be firm and not sticky. Cover and chill for 30 minutes (or you can chill overnight and bake the next day). Short cut: If you don't want to roll out the dough after chilling, you can form it into a tube before chilling, and then cut slices and bake. Heat oven to 350 F. I prefer to bake on air bake pans to avoid the risk of burning, and I line them with reusable parchment paper. Stoneware would probably also work well. If you don't have a heavy pan, make sure you keep a close eye on the cookies to watch for burning. Roll dough 1/4″ thick. Cut into shapes of your choice. I prefer diamonds. I try to roll out as evenly as possible, and do not re-roll the misshaped edge pieces. I just hand shape the odd bits into small rounds. Place on pan with small amount of space between cookies. Bake for 15-20 minutes, until edges just start to br0wn (this may go faster on thinner pans, slower on stoneware). Remove from oven and cool on wire rack. 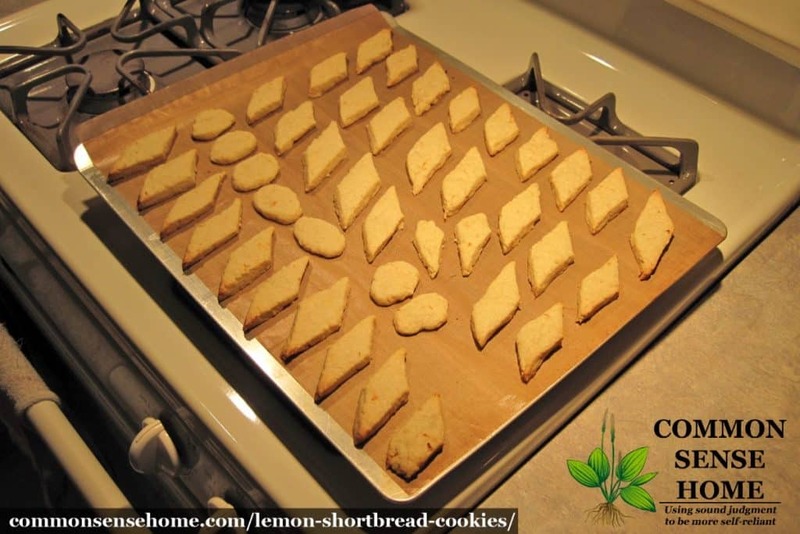 Makes around 3 dozen cookies, 1″x1 1/2″. Rolling out the cookie dough and prepping it for the oven. Extreme cookie close up – note the little air pockets. Cut together butter, sugar, zest and extract with a fork or pastry blender. Cut in flour until well blended, form into a ball with your hands. If dough seems dry, you can add a bit of lemon juice. It should be firm and not sticky. Cover and chill for 30 minutes (or you can chill overnight and bake the next day). Short cut: If you don’t want to roll out the dough after chilling, you can form it into a tube before chilling, and then cut slices and bake. I prefer to bake on air bake pans to avoid the risk of burning, and I line them with reusable parchment paper. Stoneware would probably also work well. If you don’t have a heavy pan, make sure you keep a close eye on the cookies to watch for burning. Cut into shapes of your choice. I try to roll out as evenly as possible, and do not re-roll the misshaped edge pieces. I just hand shape the odd bits into small rounds. Place on pan with small amount of space between cookies. Bake for 15-20 minutes, until edges just start to br0wn (this may go faster on thinner pans, slower on stoneware). 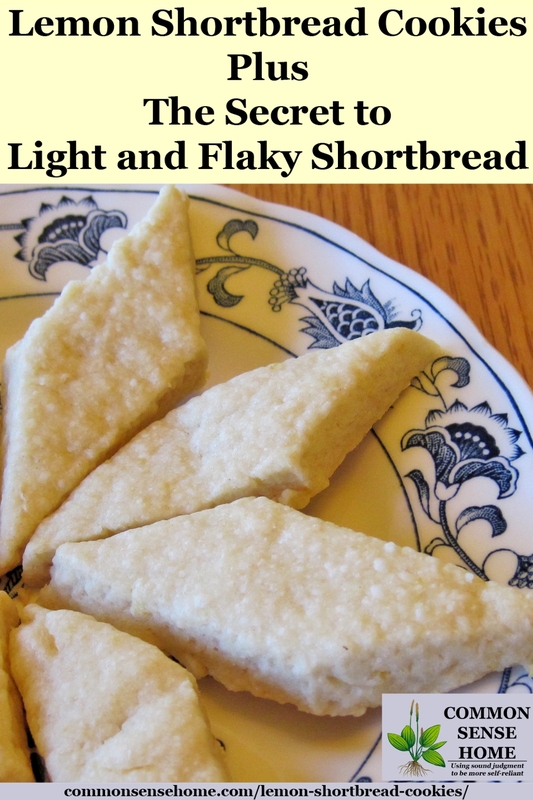 The secret to perfect shortbread is to keep your ingredients cold, and don’t overwork the dough. Originally written in 2013, updated 2016.
what do you frost with, lemon and powdered sugar? The ones in the photo are naked, but if you like you could mix a small amount of lemon juice (I’d start with no more than a tablespoon) and add enough powdered sugar to make a thin glaze, then brush it on or drizzle it over the cookies. There are some other glaze options in the Pumpkin Spice Scones recipe. You can skip the extract all together, or substitute the flavor of your choice. I found that I had to use a pretty large amount of lemon juice for this – about 1/3 to 1/2 cup. Also, I shook the cookies gently in a brown bag with some powdered sugar and that was an excellent addition. They were extremely light and delicately flavored. Very wonderful. Thanks for sharing your experience. The moisture level in the flour makes a big difference. I’m glad they still worked out for you.